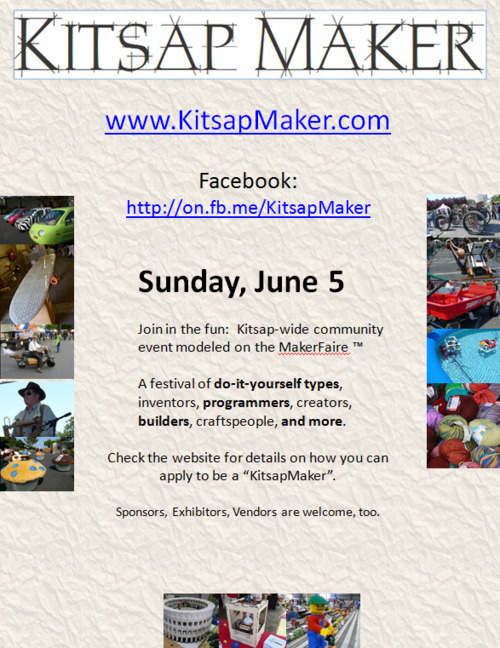 The Kitsap Maker community is hosting a Maker Event on Sunday, June 5 in Poulsbo, WA. They would love to invite all of you to participate. If you’re interested in demoing at the event (and you should), come by tomorrow and meet some of the minds behind the event. They’ll be making the trek from Poulsbo all the way here to meet YOU and talk shop. So, come by, meet some new people, and bring your awesome. P.S. It’s still 3D Printer Night, so all 3D printers and their owners are encouraged to gather as usual. P.P.S. The Kitsap Maker flier is after the jump.